The May birthstone is the emerald. Did you know that the birthstone emerald was once worn as an engagement ring? Emeralds have been worn in many different ways over the years but this year they have become a fashion must have for all the celebrities. I have seen countless stars show up wearing them on the red carpet. And let me just say if you didn’t notice them you must be blind! Everything from the large necklace and earrings worn by Kim Kardashian, Angelina Jolie with the same style earrings but paired with a huge oval ring, or my favorite Blake Lively with these emerald cut emerald and diamond earrings. 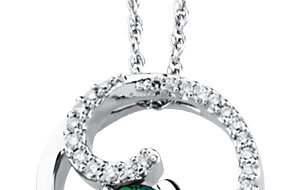 Emerald is the hot new color wither it’s the emerald stone or emerald the color. Either way don’t forget the matching accessories. The emerald belongs to the beryl family of minerals that include aquamarine (one of March’s birthstones), heliodor, and morganite. Beryl, or beryllium aluminum silicate in chemical jargon, is a six-sided symmetrical crystal. Beryl contains beryllium, aluminum, silicon, and oxygen. Emeralds vary in color from light to deep green. It’s commonly thought that an emerald’s color derives from the presence of chromium and/or vanadium replacing some of the aluminum in the mineral’s structure. The stone can, however, lose its color when heated strongly.